191 Marlborough is located on the north side of Marlborough, between Dartmouth and Exeter, with 189 Marlborough to the east and 193 Marlborough to the west. 191 Marlborough was designed by architect Carl Fehmer and built in 1881 by James Smith, mason, and Benjamin D. Whitcomb, builder, as the home of Edmund Dwight and his wife, Ellen Randolph (Coolidge) Dwight. He is shown as the owner on the original building permit application, dated March 23, 1881. Edmund Dwight purchased the land for 191 Marlborough on February 17, 1881, from John Quincy Adams, who had purchased it on November 27, 1880 from Thomas Jefferson Coolidge. It was part of a larger parcel T. Jefferson Coolidge and James Lawrence had purchased from the Commonwealth of Massachusetts on May 31, 1872 (T. Jefferson Coolidge purchased James Lawrence’s interest on December 30, 1872). 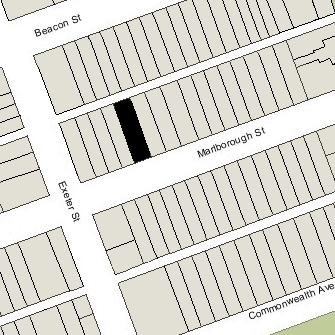 Click here for an index to the deeds for 191 Marlborough. Edmund Dwight was treasurer of the Boston Manufacturing Company (makers of hosiery), the Waltham Bleachery, and Stark Mills. Ellen Dwight died in May of 1894. Edmund Dwight continued to live at 191 Marlborough until his death in June of 1900. The Dwights had no children, and he left 191 Marlborough to his sister, Elizabeth (Dwight) Cabot, the wife of James Elliot Cabot. On September 14, 1900, 191 Marlborough was purchased from Elizabeth Cabot by Ella Cora (Brooks) Ladd, the wife of attorney Babson Savilian Ladd. They previously had lived at 803 Boylston. On November 28, 1900, she transferred the property to her brother, John Henry Brooks, as trustee on her behalf. Ella and John Brooks’s father, John Wood Brooks, was founder and President of the Michigan Central Railroad. The Ladds continued to live at 191 Marlborough during the 1914-1915 winter season, but moved thereafter to Cohasset. He died in November of 1918. 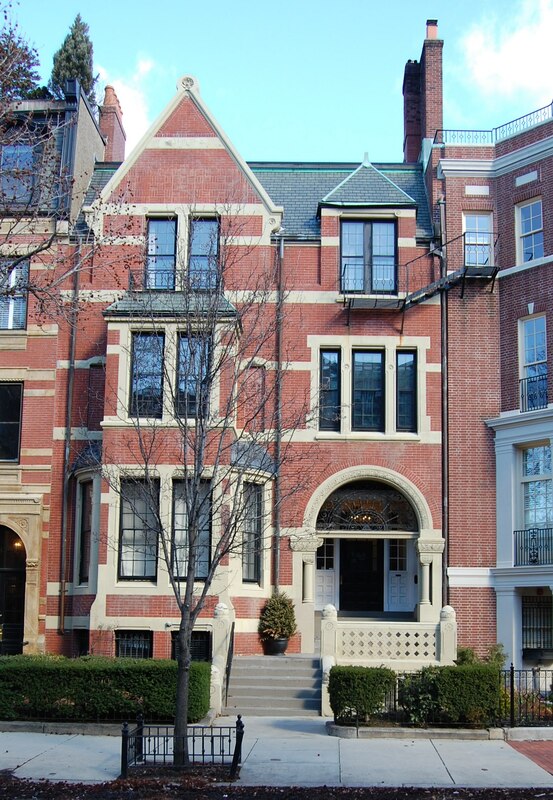 191 Marlborough was not listed in the 1916-1919 Blue Books. On March 21, 1919, 191 Marlborough was purchased from Ella Cora Ladd’s trust by Caroline Mackay (Richardson) Storrow, the wife of cotton broker Edward Cabot Storrow. They previously had lived in Milton. In June of 1919, Edward Storrow filed for (and subsequently received) permission to construct a new story over the rear area of the building. The remodeling was designed by architects Bigelow and Wadsworth. The Storrows continued to live there during the 1921-1922 winter season, but moved thereafter to Needham. They also maintained a home in Dover. On July 21, 1922, 191 Marlborough was purchased from Caroline Storrow by paper manufacturer Valentine Hollingsworth. He and his wife, Reubina (Ruby) Julia (McCormick) Hollingsworth, made it their home. They previously had lived at 173 Beacon. They also maintained a home in York Harbor, Maine, and later in Cohasset. Valentine Hollingsworth died in December of 1942. Ruby Hollingsworth continued to live at 191 Marlborough until about 1944. By 1945, it was the home of attorney Nathaniel Thayer Winthrop and his wife, Serita (Bartlett) Winthrop. They continued to live there in 1946, but had moved to an apartment at 183 Commonwealth by 1947. By 1947, Ruby Hollingsworth was living at 191 Marlborough once again. She continued to live there in 1951. On July 6, 1951, 191 Marlborough was purchased from Valentine Hollingsworth’s estate by Marene C. (Gillion) Scoullar, the wife of Frederick J. Scoullar. They lived in Lynnfield. On November 8, 1951, 191 Marlborough was acquired from Marene Scoullar by brush manufacturer Lawrence Rill Schumann. He and his wife, Edith (Rader) Jarcho Schumann lived in an apartment at 302 Beacon. In the early 1950s, Lawrence Schumann had purchased the art collection of Mrs. Marie (Walther) Sterner Lintott, an art dealer in New York City, including about 300 American and European paintings, water-colors, and drawings. He may have purchased 191 Marlborough with the idea of housing the collection there, and may have done so. While he owned the house, it was shown as vacant in City Directories and was not included in the Lists of Residents. Lawrence Schumann purchased 191 Marlborough through his company, 700 Harrison Ave., Inc. On December 20, 1951, he transferred it to his Star Brush Manufacturing Company and on the same day to himself and Mark Wainer as trustees of the Lawrence Rill Schumann Foundation. On December 17, 1952, they transferred the property to the Lawrence Rill Schumann Art Foundation, Inc.
On January 7, 1955, 191 Marlborough was acquired from the Lawrence Rill Schumann Art Foundation by real estate dealer Samuel Wasserman and his wife, Ella Frances (Brennan) Wasserman. They lived at 167 Marlborough. That same month, he filed for (and subsequently received) permission to convert the property from a single-family dwelling into eight apartments. On December 28, 1955, 191 Marlborough was acquired from the Wassermans by Raymond Everslee Wilkinson and his wife, Ruth Kimball (Leighton) Wilkinson. They lived in one of the apartments. They previously had lived in Andover. On September 30, 1958, 191 Marlborough was acquired from the Wilkinsons by Dr. Joseph Cyrus Rheingold, a physician and psychiatrist, who lived in one of the apartments. He was unmarried. He previously had lived in Rockfold, Illinois. On July 25, 1961, 191 Marlborough was purchased from Joseph Rheingold by attorney James Albert. He and his wife, Mildred (Levine) Albert, lived at 35 Commonwealth,where they operated the Academie Moderne school for modeling. 191 Marlborough remained an eight-unit apartment building. The property subsequently changed hands and on June 1, 1971, was acquired by Lewis A. Sassoon and his wife, Marcia F. Sassoon. They lived in one of the apartments. The Sassoons separated in the mid-1980s and on March 12, 1987, they transferred 191 Marlborough into his name. 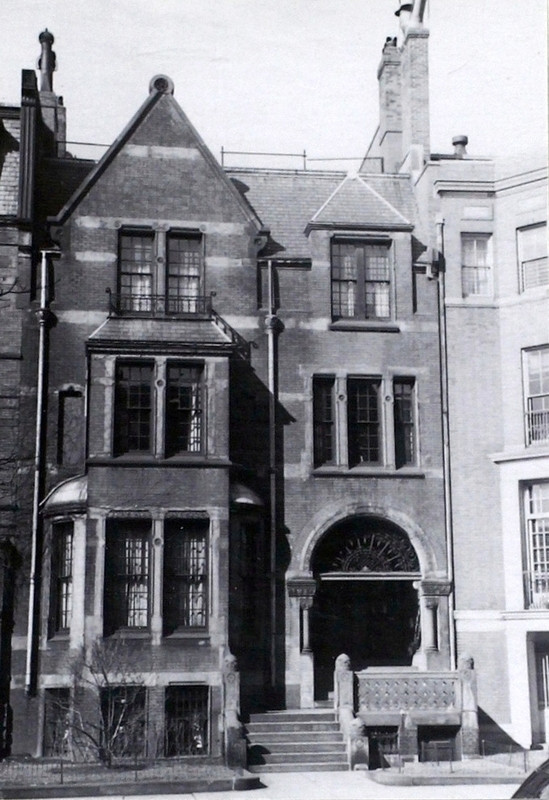 On November 16, 1992, he transferred the property to himself as trustee of the 191 Marlborough Street Trust. 191 Marlborough remained an apartment house in 2016.